Now we need new discipline! The practice of Disciplina Kičme (Spinal Discipline) is a posture assumed by bodies moving freely with poise and comfort, making the cities catwalks and assembly lines. This posture is fashioned by the Yugoform, a uniform manufactured by Yugoexport, an oral corporation and a copy of a defunct Yugoslav infrastructure of the same name. The Yugoform is composed of the Borosana labor shoe, providing the wearer with 9 hours of comfortable standing, the book Seductive Exacting Realism by Marcel Proust 12, and ABW (Army of Beautiful Women) patterns #2 and #3 dress, a garment enhanced by strolling and dancing. Yugoexport’s maxim: how to surround yourself with things in the right way is perfectly exemplified by the use of the book as an accessory of the Yugoform. Instead of being read, the book is worn to produce a straight spine and the discipline necessary to bring about a world where things and people assume solidarity and equivalence with things only blindness can demonstrate. Disciplina Kičme ushers in the age of vivified art: art that demands life and fullness of use. Yugoexport advocates such use and removes the immobilizing weight of waiting and wasting to death to provide comfort and freedom of movement. 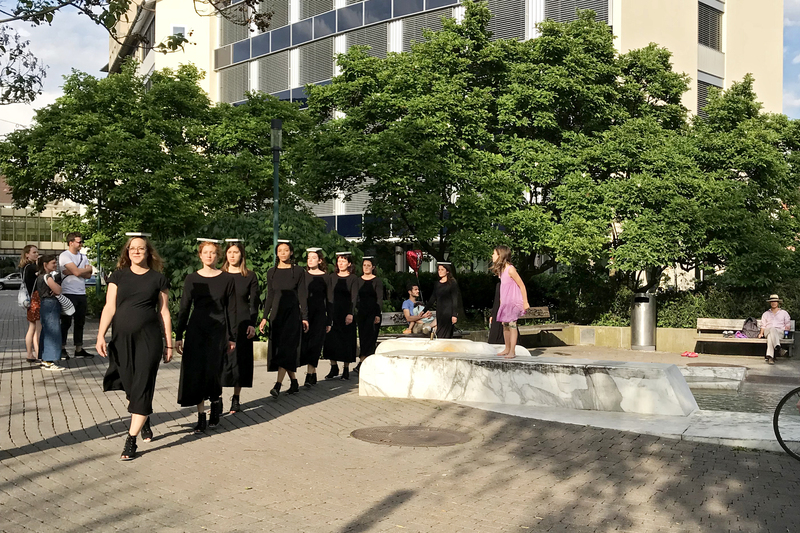 In Zurich, nine Sirens (Andrea Bühler, Laura Burgener, Martina Buzzi, Isabella Costabile, Joy von Felten, Sophie Meerwein, Andrea Oertle, Martina Salis, Sophia Seemann), an elite force within the Army of Beautiful Women, demonstrate the practice of Disciplina Kičme.